Stephen Hawking | Cool Kid Facts . Stephen William Hawking was born in January of 1942 in Oxford, England. His parents were originally from London, but as Dr. Hawking was born during World War II, it was safer for them to move to Oxford to raise children. When he was young, Stephen Hawking attended St. Albans School before eventually enrolling in University College in Oxford. He chose University College because it was where his father earned his degree. Hawking’s father also wanted him to become a medical doctor, but Hawking wanted to focus on mathematics. However, at the time mathematics was not an available major area of study at University College, so Hawking decided to major in physics. Within three years of his enrollment, Hawking had earned a natural science honors degree. In 1962, at only 20 years old, he enrolled in the University of Cambridge to study in their department of applied mathematics and theoretical physics. 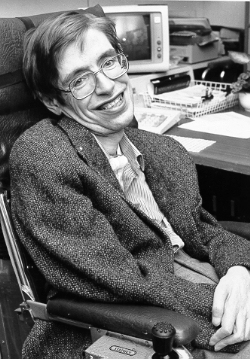 Just after turning 21, Stephen Hawking was diagnosed with ALS (amyotrophic lateral sclerosis), a motor neuron disease. Gradually, he became wheelchair-bound and had to learn to communicate with a computerized voice. However, this did not stop him from studying and excelling at physics and mathematics. At the University of Cambridge, Hawking worked under Dennis Sciama. Just three years after starting there, he earned his doctoral degree in physics by writing a thesis called Properties of Expanding Universes. Dr. Stephen Hawking studied the laws of physics that make up the universe. He wanted to understand how the universe was formed, how it works, and explain its creation and evolution. His most notable work was on expanding scientists’ understanding of Albert Einstein’s theory of general relativity. With careful calculations, Hawking found that the universe must have started with a big bang. He also stated that one day in the distant future it would end with black holes. Because of these analyses, Hawking began working on what he called a “theory of everything,” which would hopefully be able to mathematically describe general relativity (large-scale universal laws) in harmony with quantum mechanics (study of very tiny particles inside atoms). A discovery from this research was that black holes are not completely void of light, as previously believed. In order for general relativity and quantum mechanics to work in harmony, black holes must emit radiation that can fade away over time. 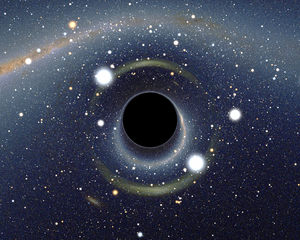 This black hole-emitted radiation is referred to as Hawking radiation. Another discovery that came from this new understanding was that the universe does not have specific boundaries or edges. One of his most well-known publications was a book called A Brief History of Time, in which he describes his research into how the universe began and how it continues to grow and expand. He published many other books during his time as well, on black holes and on his own life. Dr. Stephen Hawking also received many awards for his groundbreaking work throughout his life, including the Presidential Medal of Freedom, the Fundamental Physics Prize, the Wolf Foundation Prize, and the Copley Medal. He was a member of both the Royal Society and the United States National Academy of Sciences, in addition to the Pontifical Academy of Sciences. 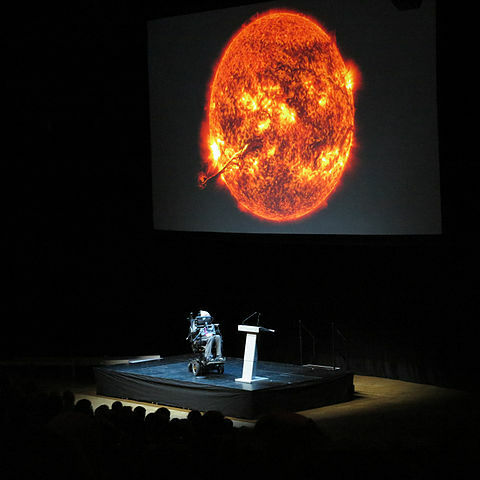 Hawking’s research allowed him to travel to give lectures. In 2009, he began working as the director of research at the University of Cambridge department of applied mathematics and theoretical physics, where he had earned his education. Dr. Stephen Hawking passed away in 2018, at the age of 76. He has three living children and grandchildren.